Perfect for Halloween, clowning, stage productions, and masquerade. Ben Nye creme makeups are easy to apply, blend and remove. Quality components and detailed directions help the novice and experienced artist achieve delightful, sometimes frightful effects. Instructors often rely on these makeup kits for clowning, aging, and theatre. Ample supply of makeup will last through several classes, rehearsals and productions. 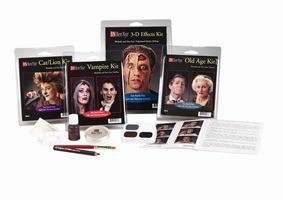 Create realistic old age characters with this kit’s special makeup. Create gruesome vampire characters with step-by-step color photos for both male and female characters. Makeup fit for a clown. Witches and zombies unite with this kit’s creme color makeup. Give audiences a good scare with this kit’s ghostly effects. Create fearsome creatures with this frightening makeup kit! Create the feline mystique with these exquisite colors and detailed directions. An exceptional assortment of quality creme clown makeup. Expert directions by former Ringling Bros. Clown and professional makeup artist, Keith Crary. Transform into the perfect tramp or charming hobo. A former Ringling Bros. clown designed this authentic auguste and white face clown characters.